As confirmed by The Hollywood Reporter, ’50s and ’60s leading man Rex Reason has died after a battle with bladder cancer. He was 86. Reason was born in Berlin in 1928 while his family was on vacation, and though he reportedly wasn’t especially interested in becoming an actor as a young man, his mother guided him and his younger brother, Rhodes Reason, into the profession. With his classical good looks and baritone speaking voice, however, Reason was a natural fit for Hollywood, and he appeared in almost 50 TV shows and movies in the ’50s and early ’60s. These include the second Black Lagoon sequel, The Creature Walks Among Us, as well as The Roaring Twenties and opposite Clark Gable in Band Of Angels. 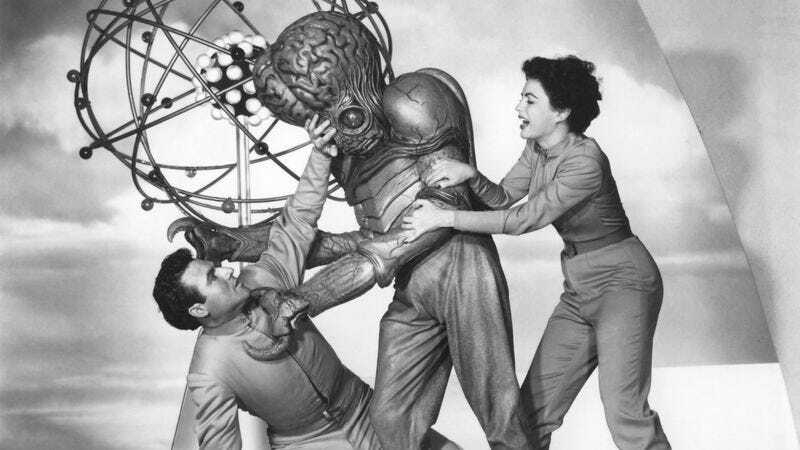 His most famous role, though, is in the 1955 cult classic sci-fi movie This Island Earth. In that film, Reason played a scientist/jet pilot (because it was a ’50s sci-fi movie) who gets recruited by the citizens of another planet in order to help them fight off some alien invaders. This Island Earth was well-received in its initial release, but its legacy took a goofy turn when it was chosen as the target of Mystery Science Theater 3000: The Movie’s wacky commentary in 1996. After appearing in a 1963 episode of Wagon Train, Reason abruptly quit acting and walked out on a Warner Bros. contract. Supposedly, Reason was being considered for a starring role in The Manchurian Candidate at the time, with his part later being given to Laurence Harvey. Reason remained in California and later became a real estate agent. Also, regarding his extremely “Hollywood” name, THR points out that—although it was his actual given name—Universal Pictures chose to list Reason as the endlessly generic “Bart Roberts” in a few of his early film credits. However, perhaps realizing that his real name was better in every way, he went back to Rex Reason after demanding that the studio allow him to use it. Reason is survived by his wife and two children, Andrea and Brent.